I heard that sentence numerous times throughout elementary school. My classmates would often comment on my messy handwriting. I didn’t think much of it. They were right about one thing: my writing wasn’t neat. As I scrambled to translate my thoughts into words, my mind was faster than my wrist, often resulting in handwriting that mimicked pseudo-cursive. I was 7 years old and didn’t fully understand the implications of my classmates’ comments. Unknowingly, my classmates were reinforcing the gender stereotype that girls were supposed to be neat and orderly. It was not what I wrote that was important, but rather how I wrote it. My words — my thoughts — were judged based on appearance, categorized and marginalized. As a girl, my words would be used merely as decoration. However, it is also important to consider what this implied about boys. This comment suggested that boys were disorganized and haphazard in their writing. What does it mean to do something “like a boy”? From a young age, many of our actions are categorized by gender. My male neighbor wasn’t supposed to go to dance rehearsal after school — dancing was a girl’s sport. I was supposed to dot my i’s with hearts and curl the edges of my a’s — anything to make my handwriting more feminine. I grew up with an acute fascination for Disney princesses and a knack for tree-climbing. Yet, only one of those actions was expected of me — the former. Those were immutable facts of life. What authority did I have to question them? However, these examples are from my experiences during elementary school. Surely these stereotypes are not enforced to the same extent at college. This yields the question, what does it mean to do something “like a boy” at Dartmouth? What is masculinity at Dartmouth, and how does it influence the expectations of our male student body? 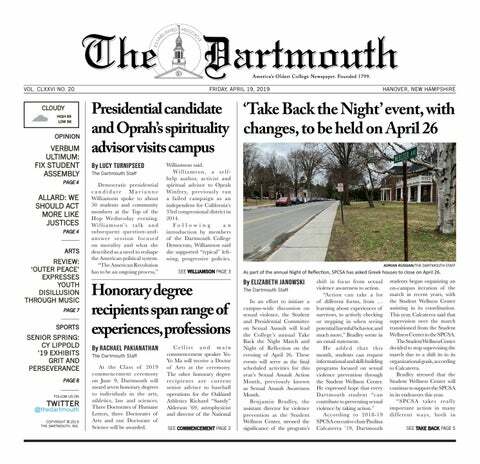 For the Class of 2022, the abrupt change from Dartmouth expectations to Dartmouth reality is still very recent. Although it is a well-known fact that Greek life is prominent on campus, the prevalence of male-dominated social scenes is not always contemplated prior to arrival on campus, as Sam Selleck ’22 noted. “It was not a factor that I considered heavily before coming to Dartmouth,” Selleck said. However, campus groups and organizations can provide students with a different perspective on masculinity at Dartmouth. Specifically, co-ed groups allow for this spread of diverse opinions. According to Selleck, campus organizations can give men the opportunity to speak to Dartmouth women about male dominated social spaces. Many times, our expectations arise from popular culture or the media. Tudor Muntianu ’22 said he had “no accurate expectations” of the average “Dartmouth bro.” With this being said, Muntianu did read Rolling Stone’s 2012 article, “Confessions of an Ivy League Frat Boy: Inside Dartmouth’s Hazing Abuses,” a piece which explored accusations of hazing and sexual assault within a Dartmouth fraternity. Muntianu did not use this article as a basis to holistically judge masculinity at Dartmouth. “I didn’t buy it at all,” Muntianu said. Recognizing that not all reputations are indicative of the campus as a whole, Muntianu did not feel any pressure to appear more or less masculine before coming to Dartmouth. The groups we are affiliated with and the people we surround ourselves with can influence our perspectives on campus norms. Beckett Richardson ’22 notes that one’s opinion on masculinity at Dartmouth can change based who someone spends time with. With various social niches that exist on campus, it may be hard to define an overarching perspective on masculinity at Dartmouth. In terms of expectations, Richardson believes that social status and sports would be positively correlated. “[I] assumed all of the popular guys would be all of the football, lacrosse and hockey players,” Richardson said. Richardson’s expectations were both validated and challenged. “I know a lot of people [who conform to expectations], but I also know some people who are pretty far away from that culture,” he said. Richardson, a member of the club baseball team, explains that most upperclassmen on the team are affiliated with Greek life, a common topic of conversation. This provides Richardson with yet another perspective on masculinity — a more “traditional, athletic” one, as he describes it. Upperclassmen are yet another source of input for our expectations. Jack Roney ’22 describes how his older cousin, a member of the Class of 2018, provided an example of masculine qualities to emulate. “He was very sure of himself, but he also was able to acknowledge when he wasn’t and ask for help,” Roney said. Roney is aware of the stereotypes that exist for individuals who identify as masculine. At his Catholic elementary school there was pressure to conform to one’s gender. “Even in first grade or kindergarten, the teachers would tell the boys not to cry ... which definitely left an impression on me,” Roney said. However, at Roney’s high school, there was “little pressure to conform to a gender norm,” which provided a better environment. The realities of masculinity at Dartmouth have yet to be fully defined, but if his cousin’s behaviors are any indication, Dartmouth’s views on conformity should resemble that of his high school. Masculinity is hard to define and constantly evolving. Expectations are estimations. Preconceived notions are often consolidated and distilled into over-simplified generalizations. Although at times it may be hard to ignore the comments that suggest that you write like a boy or cry like a girl, it is important to remember that the only way you should do something is like yourself, even at Dartmouth, especially at Dartmouth.